A rendering of Azizi Grand. 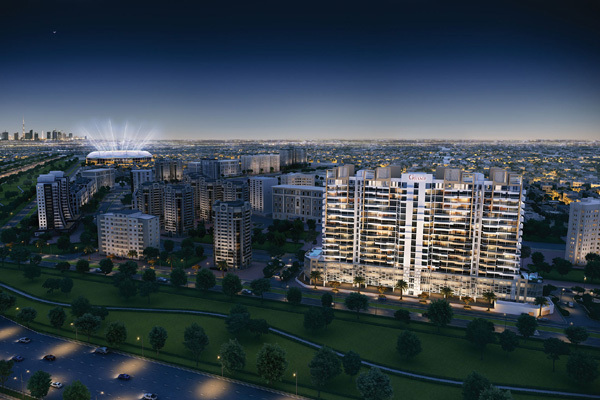 Azizi Developments, a leading private developer in the UAE, has announced a new residential project in Dubai Sports City as well as three new premium residential and commercial projects in Meydan Avenue, worth a combined value of Dh750 million ($204.1 million). The developer’s first project in Dubai Sports City, Azizi Grand will consist of 431 apartments with balconies, including 238 studio, 140 one-bedroom, and 53 two-bedroom units. Spread across 47,100 sq m, the building includes a dramatic architectural feature that resembles four towers merging into one. It also features two swimming pools, six panoramic view elevators, and two staircases. The project is located along the bourgeoning Sheikh Mohammed bin Zayed Road corridor, and just minutes away from the expanding Al Maktoum International Airport and the site of Expo 2020. Mirwais Azizi, chairman of Azizi Group, said: “As Azizi Developments’ first project in Dubai Sports City, Azizi Grand is a reflection of our strategy to develop products in strategic areas of Dubai where neighbourhoods and communities will thrive. We are confident that Azizi Grand’s modern design and superb location will offer a high-value proposition for long-term investors and end-users looking for strong returns." Meanwhile, the new projects at Meydan Avenue will consist of three low-rise buildings located along the Meydan Road leading to the Meydan Hotel and Meydan Racecourse and Grandstand that offer character living within the new and upcoming vibrant Meydan Avenue community. The three individual complexes – Azizi Gardens, Azizi Park Avenue, and Azizi Greenfield – will comprise a total of 242 one- and two-bedroom apartments incorporating elements of open green spaces, including landscaped areas, parks, gardens and a waterfront feature that gives an aesthetic appeal. Azizi Gardens, Azizi Park Avenue, and Azizi Greenfield offer a premium serene community lifestyle, with contemporary postmodern architecture including landscaped parks and gardens. Adding to the appeal is the projects prime location near the Dubai Water Canal, the Meydan Hotel and the Meydan Grandstand, with quick transport links to Business Bay, Dubai Mall, Safa Park and Jumeirah Beach Park. Encompassing a wide network of restaurants and retail outlets alongside a 500m waterfront boardwalk, the Meydan Avenue community offers an exciting and elevated lifestyle experience. Azizi Gardens will consist of a total of 51 apartments, including 40 one-bedroom and 11 two-bedroom units. The architectural team has conceived tree-inspired architecture to enhance the look and feel of the building. The building will be fitted with elevators that offer panoramic views of the internal courtyard of the building. The rooftop pool and gym will offer absolute privacy with distant views of major city landmarks close to Downtown Dubai. Azizi Gardens also shares proximity to the boardwalk canal feature. Located closest to the prestigious Meydan Hotel, Azizi Greenfield comprises 96 apartments with 61 one-bedroom and 35 two-bedroom units and boasts a unique texturised façade and patches of greenery within the building along with resort-style landscaping and canopies. A courtyard with a shaded pool creates a luxurious resort-like vibe, while a ‘Frame’ design at the front of the building will add to its aesthetic appeal. Azizi Greenfield also includes all amenities, including the podium, gym, and pool and covered car parking. Azizi Developments continues to offer the best community living experience and is increasingly focusing on creating urban neighbourhoods supported by investments in developing signature communities. The developer has also increased its focus on green buildings and sustainable developments in line with the UAE Vision 2021 which aims to achieve a balance between economic and social development.